Victorious Conservative candidate Robert Jenrick at the Newark by-election count. I’m more interested in the brick arches behind him to be honest. What was the most interesting thing about the Newark by-election earlier this month? 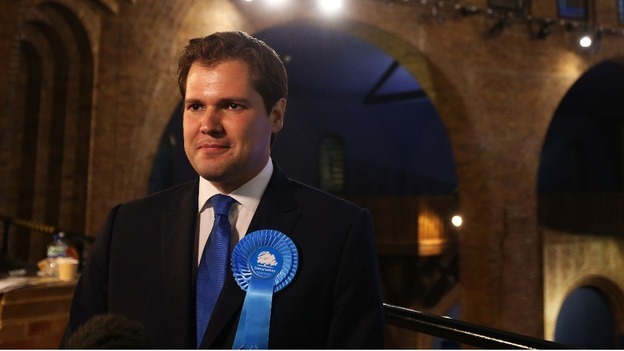 Not the failure of UKIP to break through (for once I was glad a Conservative candidate won. A UKIP victory would have inflicted psychological damage on the Tories and been seized on by Labour, but it would in the long-term have been bad for politics as all parties would have to pander even more to the Euro-sceptic right). No, what fascinated me was not the votes themselves, but the extraordinary building they were counted in: a vast, red-brick arched hall. What was that huge, dimly-lit concrete dome overhead? Were Newark’s votes being counted in Hagia Sophia, an ornate waterworks, the undercroft of a water tower, or the vaults of Westminster’s Catholic cathedral? It turns out that Newark and Sherwood Council, in whose district the Newark constituency lies, is headquartered at Kelham Hall, the ancestral home of the Manners-Sutton family and later a theological college for an Anglican Order of Monks before the council took it over in 1973. The main Hall dates from 1859 and is designed by Sir George Gilbert Scott (of St Pancras fame) but its Byzantine, domed chapel in which the election count was held was built in 1928 by an obscure Derby architect, Charles Clayton Thompson (1873-1932). What a chapel it is: at 68 feet (21 m) high, it’s the second largest concrete dome in England and has an extraordinary flying arch. A virtual tour can be enjoyed here. Making predictions about the next general election result from a by-election is a Byzantine process, and for once the backdrop was as Byzantine as the punditry. UKIP supporters looked like they were about to be bricked up in the chapel, their electoral mausoleum. If Newark did mark the beginning of the end of UKIP, the funereal count venue was very well chosen. Hamlets in May 2014, the former Troxy cinema in Limehouse. Its slogan, Home to Astonishing Events, could hardly be more apt given that the count saw the remarkable survival of independent mayor Lutfur Rahman in a borough that used to be solidly Labour. The Troxy’s ornate Art Deco interior suited the complexity of Tower Hamlets politics down to the ground. Sadly the Newark by-election may be the last time a count is held in that extraordinary chapel: the council is trying to sell Kelham hall for £2.5m through agents Savills, complete with its wedding reception and conference business but presumably without the election counts. This is part of a wider trend to relocate election counts away from old Town Halls and into more functional spaces like gymnasia or warehouses. The first election counts I attended in the late 1990s were in Woolwich Town Hall, a Baroque building which induced Baroque behaviour among the candidates and hangers-on: you could look down imperiously on the votes being counted in the galleried Victoria and Public Halls, or conspire with comrades in dark corners (as any Greenwich councillor knows, the real blood is spilt not at the council election count but the internal Labour group elections that follow a few days later). But having counts split between several rooms in a cramped Town Hall was never practical. Since 2006 election counts in Greenwich have mostly been held at the Waterfront Leisure Centre, a soulless 1980s brick box from which the Thames is barely visible. An exception was the legendary 2010 election count, held in the windowless David Beckham Academy – like a giant plastic marquee – on the Greenwich Peninsula. A freak cold snap in early May, combined with air-conditioning that no-one could switch off, meant that counting staff shivered and had to wear gloves and hats to get through the overnight count (an unusually long one, given that a general election and local election had been held simultaneously). The count felt to me a bit like an endless wedding reception in which no alcohol is served and the bride and groom’s families aren’t speaking to each other. I blogged about that count at the time but former Conservative Councillor Nigel Fletcher has best described the “underlying awfulness” of being “stuck overnight in a freezing cold hanger battling hypothermia as well as exhaustion”. Councillors in Greenwich are often accused of having a cushy life, thanks to the lavish annual mayor-making ceremony and knees-up in Greenwich’s Painted Hall they attend, but that count would have silenced even the most cynical of such voices. I had to catch a few hours sleep and then attend a recount, though thankfully it was held in the Baroque Town Hall, not an unheated marquee. Lewisham has also outgrown its Town Hall: its election count in 2014 was held in Holly Hedge House – the Territorial Army base on Blackheath, and apparently the largest drill hall in the UK – as the 2010 count venue, Sedghill School, was out of bounds because of exam timetables. The O2, Excel and the Broadway Theatre and the next-door Civic Suite were judged “too expensive, too impractical or both” according to an internal report. I’ve never been inside the Victorian drill hall with its curved, glazed roof but it seems an appropriate setting for a count at which all of Lewisham’s surviving Lib Dem and Conservative councillors were given their marching orders. My own memories of election counts are clouded by the fact that I have, almost always, expected them to mark the end of my career (as a councillor in the ultra-marginal Blackheath Westcombe ward in Greenwich I was convinced that I would lose my seat at the election counts in 2002, 2006 and 2010). But despite the often uninspiring settings, and the sense of impending mortality, election counts still feel humbling – and magical. They are also timeless: it is too costly to automate the counting of small numbers of ballot papers used in local elections, so voting and counting is still all done by hand. Even at the 2014 count last month back at the Waterfront (well-documented by the ever-reliable 853 blog), I counted only a few laptop computers for the final number-crunching: the rest of the process was done (with scrupulous accuracy) by pen and paper. As someone once said (does anyone know who? 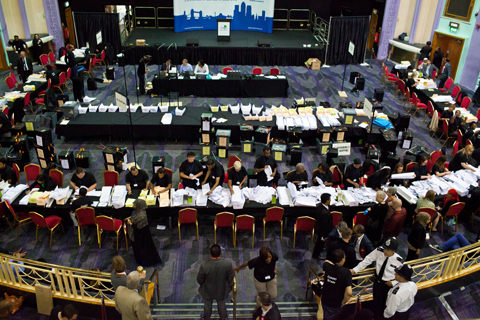 ), one of the best sounds in the world is the crash of metal ballot boxes on tables at the start of an election count. Whatever the venue, it’s a noise that will always excite and inspire. I only hope that in future the noise will still echo around chapels and drill halls, not just sports halls with fluorescent lighting. This entry was posted in Uncategorized and tagged Architecture, Conservatives, Elections, History, Politics. Bookmark the permalink.